Get some cultural insight at Historic Center (Centro Historico) and Zona Arqueologica Teotihuacan. Let the collections at Museo del Templo Mayor and Palacio de Bellas Artes capture your imagination. Step out of Mexico City with an excursion to Robert Brady Museum in Cuernavaca--about 1h 20 min away. There's still lots to do: see the interesting displays at National Museum of Anthropology (Museo Nacional de Antropologia), explore the ancient world of Metropolitan Cathedral (Catedral Metropolitana), appreciate the extensive heritage of Zocalo, and take a stroll through Coyoacan. To see maps, traveler tips, photos, and tourist information, go to the Mexico City online itinerary planner . If you are flying in from Argentina, the closest major airports are Licenciado Benito Juarez International Airport, Querétaro Intercontinental Airport and General Francisco J. Mujica International Airport. 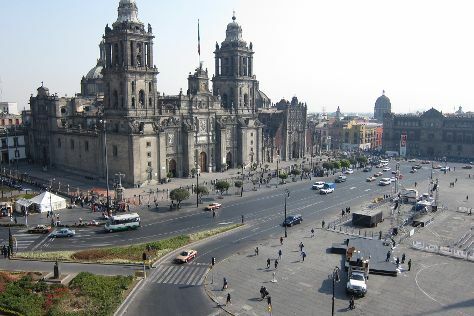 In April in Mexico City, expect temperatures between 31°C during the day and 15°C at night. Finish your sightseeing early on the 21st (Sat) so you can travel back home.